"...IR’s interdisciplinary curriculum encourages me to observe the world, using multiple lenses including politics, history, and economics." 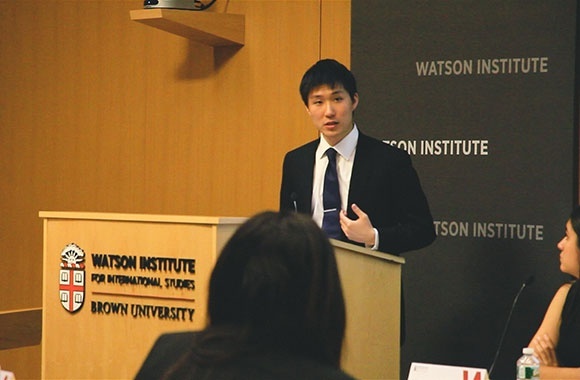 Tomonobu Kumahira was the recipient of the 2015 Mark and Betty Garrison Prize for the best thesis in international relations, foreign policy analysis, or diplomatic history. What would you consider to be the best takeaway from your IR thesis? The level of ownership makes thesis-writing an incomparable experience. When writing a thesis, you own and lead the overall process of academic research. Unlike many classes that give you reading lists and key questions, thesis writers must come up with their own research questions and design a way to solve these puzzles on their own. You brainstorm ideas, define your question, find a method, execute research, and publish the results. Although advisors and professors are extremely supportive, you will be the one who make important decisions throughout the research. It was very unique experience for me, as an undergraduate student, to go through this overall process of research just like scholars and graduate students. According to my advisor, thesis students are no longer “consumers of knowledge,” who simply learn about what other academia have studied. Instead, thesis writing teaches how you, as a “creator of knowledge,” can build your research in order to contribute to existing academic context. How do you see the skills you learned at Brown helping you in your future career, and what are your plans now that you've graduated? I will be working as an asset management analyst for Mitsubishi Corporation, a trading/investment firm in Tokyo. Since the company deals with global markets varying from energy to food, many IR concepts such as security, development, and international finance help me assess geopolitical environment for potential business opportunities. Also, IR’s interdisciplinary curriculum encourages me to observe the world, using multiple lenses including politics, history, and economics.